For those who have spent a fair amount of time fishing for salmon on Lake Michigan over the past decade, you’ve almost certainly seen quite a few ups and downs within the fishery. From the amazing highs of fast paced limit catches of King Salmon, to long periods of very tough fishing and all-time low weir returns in a variety of Lake Michigan’s tributaries. Then add in years of noticeably small adult Kings followed almost seamlessly by seasons filled with very impressive numbers of trophy sized Kings, and you’ll start to see a that things on Lake Michigan don’t always seem to follow a predictable pattern. Enter in the 2018 season and you’ll see that unpredictability in full force. The 2018 fishing season started like most others. As is the typical pattern, anglers flocked to the southern ports to capitalize on the great early season fishing these ports usually provide. Spring time hotspots generally include Michigan City, Burns Ditch, Gary, East Chicago, New Buffalo, and St. Joseph. During this time Coho Salmon are typically the first fish to show up in the shallows just as the waters begin to warm. Traditionally King Salmon would arrive later and prey on the schools of Alewife that would amass near warm water inlets and river outflows, especially after spring rains. Unfortunately, ‘traditional’ hadn’t meant much lately as Lake Michigan’s suppressed Alewife and King Salmon numbers had led to several seasons of tough spring fishing, at least from a King Salmon standpoint. But that was certainly not the case in 2018. As the calendar turned to late April a trend began emerging. A few local tournaments in Michigan City were won with some very impressive, if not staggering, numbers. Winning catches consisted of 5 King Salmon approaching or even surpassing 100 lbs. That would be noteworthy in August, but this was April! Once we hit the month of May that trend only became more prevalent. The Kings weren’t just big, but they were plentiful. Limit catches of tackle busting fish were being caught all across the southern ports in short order. Fishermen were breaking off tackle and filling coolers like they hadn’t done in quite some time. 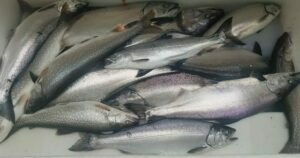 And not only was the fishing great for King Salmon, but at the same time there was solid offshore action for Coho Salmon and Steelhead, while there was also terrific action for Lake Trout on structure closer to shore. The fishing possibilities were truly phenomenal. Many of the locals and old timers couldn’t recall a time when King Salmon were so plentiful and sizable, at the same moment in time. Tournament records were being broken week after week. Coolers were being broken. Charter fishing clients and fishermen alike were getting spoiled on a daily basis. Bait and tackle shops along the southern Lake Michigan shoreline were reaping the benefits of all the gear being destroyed by so many big and feisty King Salmon. But where the heck did all those fish come from? That was the question that had many very respected anglers across Lake Michigan puzzled. After years of lean fishing for King Salmon, most successful fishermen had accepted that targeting merely King Salmon day after day was almost an exercise in futility and had adopted their techniques to target a variety of species. The most widely accepted theory is that conditions were perfect to concentrate a very large percentage of Lake Michigan’s King Salmon population near the southern ports. An early May warm up along with a significant amount of rainfall in southwest Michigan seemed to set the tables for what was about to happen. The warm weather and spring rains not only warmed the water, but also filled it with nutrients and in turn gave it a very fertile greenish color. This seemed to trigger a major influx of baitfish to the southern parts of the lake. Schools of Alewives surrounded the river mouths as they pumped warm nutrient rich water into Lake Michigan. It wasn’t long before hungry Kings began to flock to these areas to take advantage the easy meals. The result was amazing fishing due to an overwhelming concentration of fish in a relatively small area. 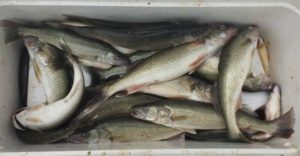 Sure, there were Kings being caught all over Lake Michigan during the month of May. But ground zero seemed to be located in the waters between Michigan City, Indiana and South Haven, Michigan. As the season wore on the massive schools of baitfish broke up, and with it, so did the schools of King Salmon. Fishing during the summer months was fair from most ports but never really regained the huge spark that ignited the season during the spring. Despite the up and down numbers during the season, there was one constant; the mature King Salmon were very large. From the record-breaking tournament catches in the spring months to the numerous 30 pound plus Kings weighed in at tackle shops lake wide, 2018 was another year with big fish. While overall the numbers may not quite be what they were in the heydays, the size shows the population is more in tune with the available forage than during many of the years with more plentiful but very lean adult salmon. Less King Salmon may simply be a necessary evil for an ecosystem that has been invaded with nonnative species, each of which creates an added stressor on the entire food chain. 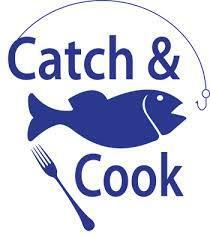 Despite what anyone says about the current state of the Lake Michigan fishery, there is only one certainty. And that is that there are no guarantees and absolutely nothing should be taken for granted. There are simply too many variables in play, most of which are outside of human intervention. From water levels, to baitfish numbers, to weather, and zooplankton numbers, and finally the introduction and impact of invasive species there are simply too many driving factors to micromanage such a large ecosystem. Much like biologists and fisheries managers must keep their expectations in check so do the fishermen of this Great Lake. While it would be awesome to see another record setting season for King Salmon this coming spring, it likely isn’t realistic to expect it. But that doesn’t mean that you shouldn’t expect good fishing. Even at times when the fishing for Kings is tough, remember that there are other species that not only offer great fishing opportunities, but also are a blast to catch. For anyone who’s followed along for awhile probably knows that we’ve been encouraging anglers to be opportunistic on any given day and take the best option that’s available. 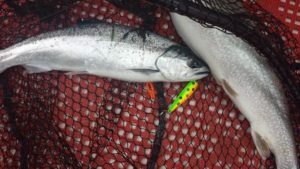 If the fishing has been good offshore for Steelhead and Coho Salmon that it might be time to load up with your favorite bright spoons and head out there. If the Lake Trout fishing on nearshore structure has been good, then it is likely best to load up your best trout gear and go after them. We’ll be out there making the best of whatever the lake gives us, we hope to see you out there too.